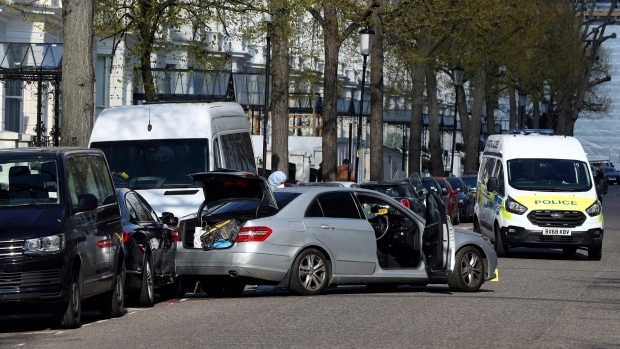 Police "discharged firearms" and sealed off a street in the western Holland Park area of London after a reported confrontation with a vehicle near the Ukrainian Embassy. The Ukraine embassy said: "The police were called immediately, and the suspect's vehicle was blocked up". She added that officers arrived "very quick" and saw "many police cars coming". Earlier, eyewitnesses, as quoted by the Daily Star, stated that the gunfire allegedly came from a vehicle near the embassy building, with police returning fire. Scotland Yard confirmed that a man in his 40s was arrested at the scene and taken to a central London hospital as a precaution, following the use of firearms and a taser. Witnesses heard at least 10 gunshots fired. The incident is not being treated as terrorism, added police. He praised police for responding quickly.